‘Tis the season for evergreens: pine wreaths, juniper branch arrangements, and whole trees invited to reside indoors. This seasonal greenery not only serves as decoration, it brings a woodsy aroma that no synthetic air freshener can match. Science recognizes a clear link between smell and memory. So what images do fragrant evergreens conjure? In ancient cultures from both the East and West, evergreens represent longevity. In the cold months when all other plant life withers away, evergreens serve as a reminder that, even in the darkest part of the year, life endures. All conifers (a name referring to the cone shaped seed pods of evergreens) have a cool and refreshing scent thanks to chemicals known as essential oils. Conifer essential oils are both calming and invigorating. In Aromatherapy they are used to stimulate a tired mind and soothe a tense body. Pine essential oil is usually sourced from the long, thin needles of the towering Scots pine (Pinus sylvestris), but other pine species are used as well. A longtime favorite in bath, beauty, and cleaning products, pine oil has an unmistakably fresh scent that has earned generations of dedicated fans. Due to a recent shortage of pine essential oil, Clorox changed the signature scent of Pine Sol—a pine-scented cleaning product that has been in production since 1929. The new scent triggered a social media uproar, and a petition urging Clorox to change it back. Pine not only smells clean, it actually disinfects. Pine is an antibacterial, antifungal, antiseptic, and antiviral that can clear airborne pathogens. Used topically, pine oil is used for skin issues such as eczema, psoriasis, and athlete’s foot. 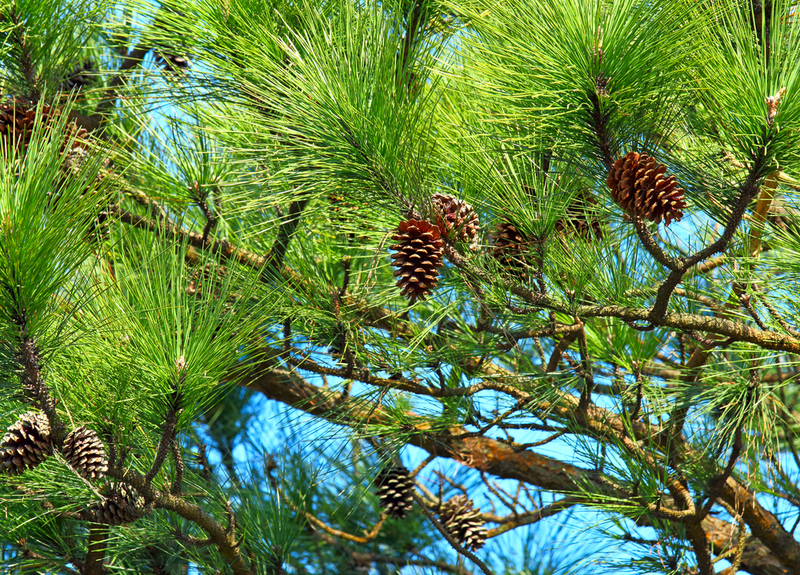 Pine oil is also used to improve circulation and provide pain relief. Ancient Greek physician Hippocrates recommended a pine oil massage for sore muscles. Pine needle mattresses are still found in the Swiss Alps to treat joint inflammation. All conifer oils have a grounding effect. Pine in particular brings focus to a scattered mind. Regular whiffs can relieve fatigue and anxiety, and can help clear a fog of grief and guilt. 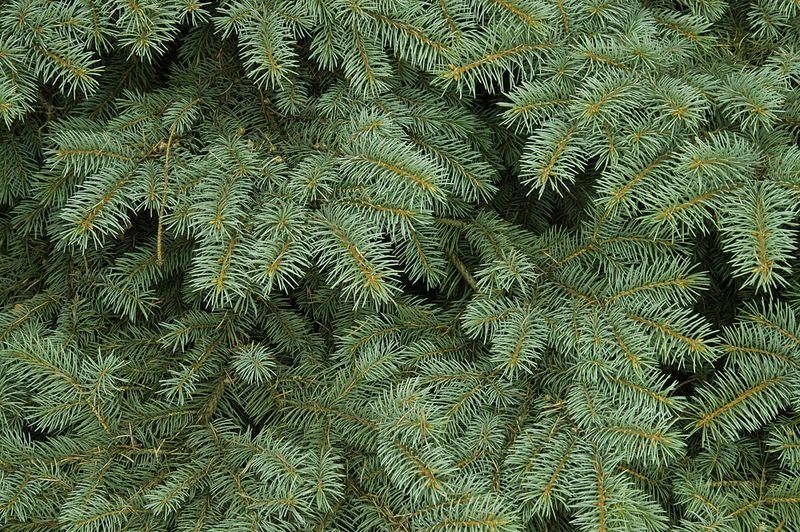 Spruce is also synonymous with clean—think of “sprucing up” the house before company arrives. 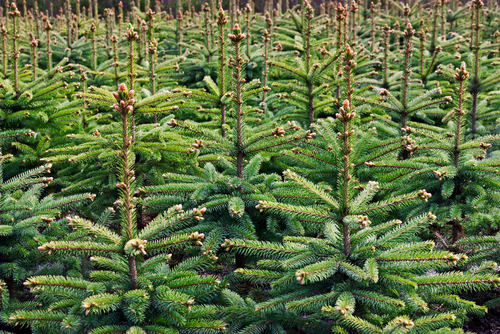 Although similar to pine, the smell of spruce is darker, earthier, and more complex. 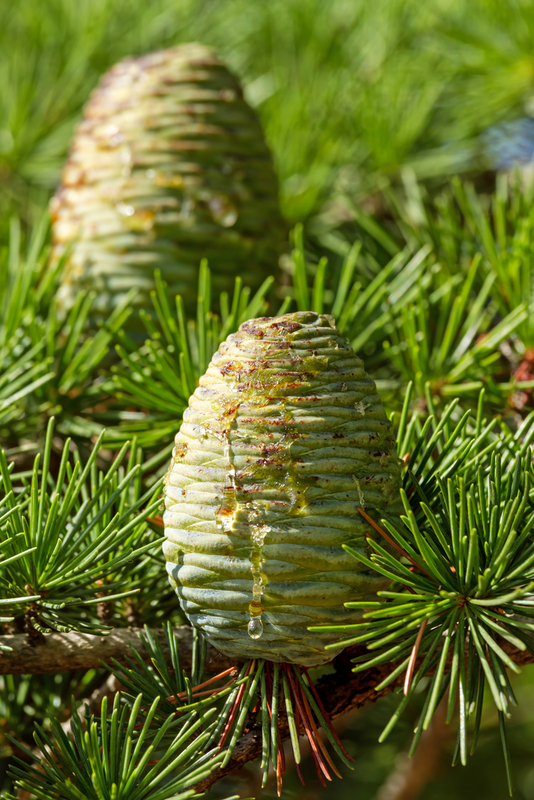 All conifer oils are used to treat lung problems, but spruce has a special affinity for phlegm in the lungs. A few drops rubbed into the chest or with regular inhalations, spruce oil can help clear congestion, quiet a cough, and used over time may improve chronic bronchitis and asthma. 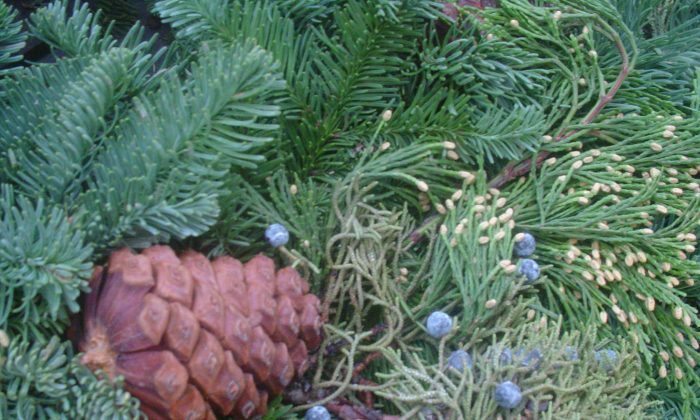 The variety most of us know is blue spruce (which gets its color from a blue wax that coats the needles in the spring). The essential oil is often sourced from the fragrant black spruce (Picea marina), a slow-growing, cold-loving North American native with short needles and dark purple cones. In addition to scenting soaps and air fresheners, spruce oil is used to fight fatigue—either due to a typical afternoon slump, or adrenal exhaustion. Peter Holmes, herbalist and founder of therapeutic grade Snow Lotus essential oils, suggests black spruce oil as a remedy for the endocrine system, for imbalances in the pituitary, adrenal, and thyroid glands. Spruce is also used for those suffering from anxiety and grief. Fir has a savory forest aroma with healing properties similar to the conifers mentioned above, but is usually less expensive. The oil is often sourced from Siberian or Balsam fir trees and used for poor memory, insecurity, and to improve immune function. This scent offers strength in times of overwhelming tribulation. 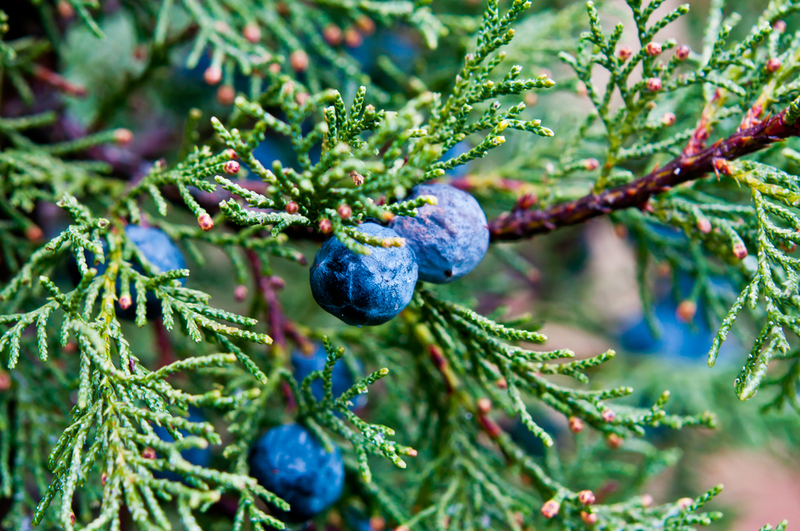 Juniper is best known as the predominant flavor in gin. Its blue-purple berries are used in herbal medicine to treat bladder problems, kidney stones, and as a digestive aid, particularly in over-indulgence. Juniper essential oil can be used for similar ailments. Juniper is a shrub from the cypress family of conifers. Several ancient cultures used juniper incense to repel evil spirits, and it is still used in purification rituals today. Juniper oil is an antimicrobial that was used in hospitals during the 1918 flu epidemic to prevent air borne infection. Use juniper oil to enhance concentration, alleviate anxiety, and relieve stress. Jeanne Rose, author of several Aromatherapy books, suggests juniper oil for panic attacks. While most evergreen essential oils are extracted from needles and twigs, cedar oil comes from the fragrant wood, which explains why the oil’s smell is redolent of lumber. A number of different trees bear the name of cedarwood oil—from the true cedars related to pine (Lebanon and Atlas cedars), to various members of the cypress family of conifers. Cedar is a tall tree held in high esteem in the ancient world. The name cedar comes from the Arabic word “kedron” which means power. Solomon’s Temple was built with cedar, and the oil is mentioned numerous times in the Bible. True cedarwood has a warm scent that can serve as an antidepressant and aphrodisiac. Like other conifers, cedar addresses lung congestion, but also assists with congestion in the lower body, such as heavy periods, an inflamed and irritable bowel, and an enlarged prostate. Often applied topically, cedarwood oil is used for skin infections, cellulite, and dandruff. Plants produce essential oils to both attract pollinators, and repel pests, but humans have found numerous other uses for them. While some essential oils are caustic, most conifer oils can be applied directly to the skin. If irritation is a concern, dilute in a fat-based carrier oil such as olive or almond. Although we typically think of medicine as something to be ingested, essential oils are mainly administered through smell. Either sniff gently directly from the bottle, or warm a drop or two in your hands and breathe it in. If you’re on the go, put a few drops on a cotton ball or tissue that you can keep in your pocket to inhale throughout the day. Essential oils can be added to a hot bath, massage oil, diluted in water and misted from a spray bottle, or dispersed in a room with a nebulizer or diffusor. Essential oils are generally broad spectrum, meaning they benefit multiple areas of the body simultaneously.